In 1902 the artist Pekka Halonen constructed a splendid log-built studio villa, to his own designs and drawings, on a rocky promontory right by the lakeside. He had already lived for some time in Tuusula, in the village of Tuomala. For the production of altar paintings he needed a larger work area, and thus the main room at Halosenniemi is the studio, two storeys high. Together with his wife Maija Halonen and eight children, Pekka Halonen lived and worked at Halosenniemi for more than three decades. This was the place where artists from the local community met to discuss world events, to philosophize, to listen to music and to enjoy the smoke sauna in the garden. Pekka Halonen is known for his paintings of Finnish nature and his depictions of robust country people. He depicted the views from Halosenniemi in all seasons, but the best-known of these are his winter pictures, which he insisted on painting outdoors even though the temperature was far below zero. Ultimately Halosenniemi passed into the ownership of Tuusula Municipality, and in the 1990s it was restored to the condition it was in when the Halonen family lived there. 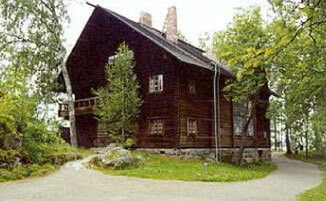 The museum hosts various art exhibitions, and maintains the traditions of Pekka Halonen and his family.